Objectives: In diabetes mellitus type 1, beta cells are mostly destroyed; while in diabetes mellitus type 2, beta cells are reduced by 40% to 60%. We hope that soon, stem cells can be used in diabetes therapy via pancreatic beta cell replacement. Induced pluripotent stem cells are a kind of stem cell taken from an adult somatic cell by “stimulating” certain genes. These induced pluripotent stem cells may be a promising source of cell therapy. This study sought to produce isletlike clusters of insulin-producing cells taken from induced pluripotent stem cells. 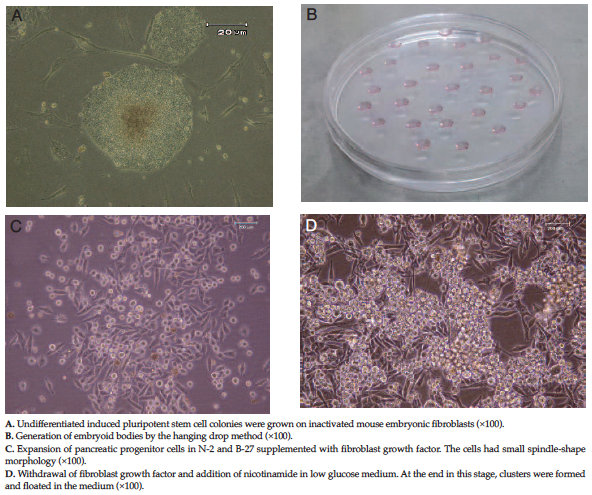 Materials and Methods: A human-induced pluri-potent stem cell line was induced into isletlike clusters via a 4-step protocol, by adding insulin, transferrin, and selenium (ITS), N2, B27, fibroblast growth factor, and nicotinamide. During differentiation, expression of pancreatic β-cell genes was evaluated by reverse transcriptase-polymerase chain reaction; the morphologic changes of induced pluripotent stem cells toward isletlike clusters were observed by a light microscope. Dithizone staining was used to stain these isletlike clusters. Insulin produced by these clusters was evaluated by radio immunosorbent assay, and the secretion capacity was analyzed with a glucose challenge test. Results: Differentiation was evaluated by analyzing the morphology, dithizone staining, real-time quantitative polymerase chain reaction, and immunocytochemistry. 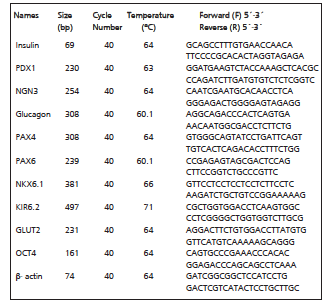 Gene expression of insulin, glucagon, PDX1, NGN3, PAX4, PAX6, NKX6.1, KIR6.2, and GLUT2 were documented by analyzing real-time quantitative polymerase chain reaction. Dithizone-stained cellular clusters were observed after 23 days. The isletlike clusters significantly produced insulin. The isletlike clusters could increase insulin secretion after a glucose challenge test. Conclusions: This work provides a model for studying the differentiation of human-induced pluripotent stem cells to insulin-producing cells. This study was designed to generate ILCs using a human-induced pluripotent stem cell line. The differentiation was performed using a 4-step protocol over the course of 4 weeks. The findings suggest that it is possible to produce ILCs from human-induced pluripotent stem cells. A human-induced pluripotent stem cell line (RSCB0082) was purchased from Iranian Royan stem cell bank.23 It had been produced by reprogramming a 42-year-old man’s dermal fibroblast cells. The induced pluripotent stem cells were grown on mitotically inactivated mouse embryonic fibroblasts in 70% Dulbecco's Modified Eagle Medium (DMEM)/F12 (Gibco [now Invitrogen Corporation], Carlsbad, CA, USA) supplemented with 20% knockout serum (Gibco), 0.1 mM nonessential amino acid (Gibco), 0.1 mM 2-mercaptoethanol (Sigma, St. Louis, MO, USA), insulin (5 mg/mL)-transferrin (5 mg/mL)-selenium (5 μg/mL) (Gibco), 100 IU/mL penicillin and 100 IU/mL streptomycin (Sigma) with 4 ng/mL basic fibroblast growth factor (Gibco). They were then incubated at 37°C with 5% CO2. All protocols were approved by the ethics committee of the institution before the study began, and conformed with the ethical guidelines of the 1975 Helsinki Declaration. For embryoid body formation, at first the iPSCs, colonies was trypsinized with trypsin-EDTA, and a single-cell suspension was made by pipetting the cells up and down. After counting the cells, we made hanging drops using 20 to 30 μL drops, containing 2000 cells, in a high DMEM media, 10% fetal bovine serum without bFGF, and they were placed on the lids of petri dishes, which then were incubated in CO2 for 3 days. Three-day-old embryoid bodies were plated at a density of 100 embryoid bodies/well in 6-well culture plates. The tissue culture plates were coated with 0.1% gelatin and grown for 2 weeks in DMEM/F12 medium, 1:1, insulin (10 mg/L)-transferrin (6.7 ng/L)-a selenium (5.5 mg/L), (Gibco). After 1 week, cells were separated with 0.05% trypsin-EDTA, and plated at a concentration of 2 × 105 per well in 6-well culture plates in DMEM/F12 media supplemented with 1% N-2 supplement, 2% B-27 supplement (Gibco), and 10 ng/mL fibroblast growth factor. Culture plates were coated with 0.1% gelatin (Sigma). It was during this stage that cell clusters formed. Low DMEM supplemented with 1% N-2 and 2% B-27 was used at this stage. Then, fibroblast growth factor was removed, and 10 mM nicotinic acid (Sigma) was added. 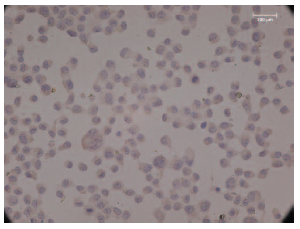 Total RNA was extracted from approximately 106 cells, using Mini-RNease - kit (CinnaGen, Tehran, Iran) according to the manufacturer’s instructions. The amount of extracted RNA was measured by OD260/280. cDNA was synthesized using M-MULV reverse transcriptase (CinnaGen) from 1 μg total RNAs to examine changes in the levels of pancreatic-specific transcription factors at the end of each stage, and they were normalized with beta-actin. All the experiments were performed in triplicate. Table 1 shows the real-time qualitative polymerase chain reaction (qPCR) primers, conditions, and product sizes. The cDNA was added to SYBR Green master mix (TaKaRa, Takara Shuzo, Otsu, Japan). Polymerase chain reaction amplifications were performed with StepOnePlus Real-Time PCR Systems (Applied Biosystems, Foster City, CA, USA). The reaction included stage 1, initiating denaturation at 95°C for 5 minutes; stage 2, denaturation at 95°C for 1 minute; and annealing for 1 minute, for 40 cycles. A final stage was run to generate a melting curve to verify amplification product specificity. At first, approximately 104 cells were fixed in acetone and placed on a slide for 3 minutes at 1000 rpm using a cytocentrifuge (Shafaara, Tehran, Iran). The peroxidase inactivation was performed by immersing it in 3% H2O2, and washing it in phosphate buffered saline for 5 minutes. During the last stage, cells were blocked with 1% blocking solution (1% bovine serum albumin and 0.1% Triton X-100 in phosphate buffered saline) (Dako A/S, Glostrup, Denmark) for 20 minutes. Slides then were incubated with anti-neurogenin3 antibody (abcam; Cambridge, MA, USA) (dilution 1:1000) and anti-Insulin (Dako A/S) (ready to use), for 40 minutes at room temperature. After washing in phosphate buffered saline, the Envision Detection System (Dako A/S) was added. The slides were washed with phosphate buffered saline for 10 minutes, visualized with diaminobenzidine (Dako A/S), and counterstained with hematoxylin (Sigma, USA). The cells in stage 1 served as negative controls. Diphenylthiocarbazone, Dithizone (Sigma) is a zinc-binding chemical substance, and pancreatic islets containing zinc, stain red when treated by it. Cells in stages 2 and 3 served as negative controls for Dithizone staining. Adherent clusters produced this way were rinsed twice in Krebs-Ringer HEPES buffer (125 mM NaCl, 4.74 mM KCl, 1 mM CaCl2, 1.2 mM KH2PO4, 1.2 mM MgSO4, 5 mM NaHCO3, 25 mM HEPES 1 mM, 0.1% bovine serum albumin, pH 7.4) containing 2.8 mM glucose (Sigma). Clusters then were incubated for 15 minutes, 30 minutes, 45 minutes, and 60 minutes in KRBH buffer with 16.7 mM (high-level) glucose. The insulin in the supernatant was determined by radioimmunoassay kit (Immunotech, Czech). Data are presented as means ± SD. Each experiment was repeated 3 times. Data from the related assay were assessed by 1-way analysis of variance (ANOVA) followed by the Tukey test for pairwise comparison. To evaluate insulin secretion, study groups were compared using a 1-way ANOVA, followed the Tukey test. Values for P < .05 were taken to be statistically significant. The statistical analyses and design of the graphs were performed using GraphPad Prism 5 software (La Jolla, CA, USA). 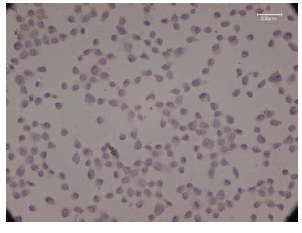 Pluripotent stem cells were induced to differentiate into ILCs by the modified 4-stage protocol. 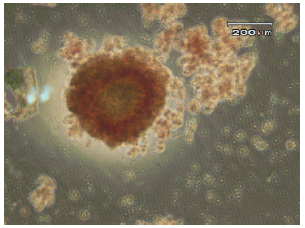 Induced pluripotent stem cells were differentiated to ILCs after 31 days (Figures 1A, 1B, 1C, and 1D). The gene expression pattern of differentiated cells at each stage were analyzed by real-time qPCR (Diagrams 1A, 1B, 1C, 1D, 1E, 1F, 1G, 1H, 1I, and 1J). During the fourth stage, ILCs were examined by immunocytochemistry for presence of insulin (Figure 2) and neurogenin 3 (Figure 3). More than 50% and 40% of the cells stained for insulin and neurogenin 3. From day 23, when the insulin-producing cells were formed, Dithizone was used to stain the cells, and the clusters became red (Figure 4). As described in Materials and Methods section, after treating the ILCs with 16.7 mM glucose during the fourth stage, an increase in insulin secretion from 17.36 ± 11.112 pmol/L (2.5 ± 1.6 μIu/mL) to 2778 ± 141.81 pmol/L (400 ± 20.42 μIu/mL) was recorded. 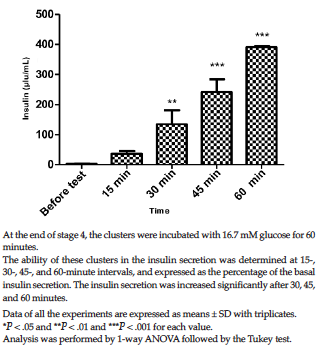 After incubating the cells for 5 to 60 minutes, the amount of secreted insulin in the medium was increased and maximum effect was seen after 60 minutes (Diagram 2). Stem cells (either from embryonic stem cells or from pancreatic progenitors) could potentially provide an abundant alternate source of islet cells for transplant therapies.5,25 The promise of therapies derived from induced pluripotent stem, and stem cells, particularly holds high hopes for diabetes treatment. During early pancreatic development, several transcription factors are activated, which ensure normal organogenesis and subsequent differentiation into endocrine cell types. Pancreatic organogenesis consists of a sequential cascade of inductive events along with the activation of specific transcription factors.26 Pdx1 is a transcription factor expressed during the early stages of pancreatic development, during islet cell differentiation, and in differentiation of beta cells. (1) Substantial efforts must be performed to produce functional ILCs in vector-free and xeno-free environment. (2) The engraftment efficacy of these cells must be evaluated in an animal model. (3) Does transplant of these induced pluripotent stem cells derived from ILCs secrete insulin physiologically, and are they effective in reducing the hyperglycemic phenotype of animal models? (4) Does immuno-rejection of the transplanted cells occur? (5) Do these cell clusters continue to grow and develop into a tumor and metastasize in vivo? Efrat S. Beta-cell replacement for insulin-dependent diabetes mellitus. Adv Drug Deliv Rev. 2008;60(2):114-123. Atkinson MA, Eisenbarth GS. Type 1 diabetes: new perspectives on disease pathogenesis and treatment. Lancet. 2001;358(9277):221-229. Erratum in: Lancet. 2001;358(9283):766. Fung MA, Warnock GL, Ao Z, et al. The effect of medical therapy and islet cell transplantation on diabetic nephropathy: an interim report. Transplantation. 2007;84(1):17-22. Thompson DM, Begg IS, Harris C, et al. Reduced progression of diabetic retinopathy after islet cell transplantation compared with intensive medical therapy. Transplantation. 2008;85(10):1400-1405. Warnock GL, Meloche RM, Thompson D, et al. Improved human pancreatic islet isolation for a prospective cohort study of islet transplantation vs best medical therapy in type 1 diabetes mellitus. Arch Surg. 2005;140(8):735-744. Lakey JR, Mirbolooki M, Shapiro AM. Current status of clinical islet cell transplantation. Methods Mol Biol. 2006;333:47-104. Gangemi A, Salehi P, Hatipoglu B, et al. Islet transplantation for brittle type 1 diabetes: the UIC protocol. Am J Transplant. 2008;8(6):1250-1261. Tateishi K, He J, Taranova O, Liang G, D'Alessio AC, Zhang Y. Generation of insulin-secreting islet-like clusters from human skin fibroblasts. J Biol Chem. 2008;283(46):31601-31607. Sapir T, Shternhall K, Meivar-Levy I, et al. Cell-replacement therapy for diabetes: Generating functional insulin-producing tissue from adult human liver cells. Proc Natl Acad Sci U S A. 2005;102(22):7964-7969. Suzuki A, Nakauchi H, Taniguchi H. Glucagon-like peptide 1 (1-37) converts intestinal epithelial cells into insulin-producing cells. Proc Natl Acad Sci U S A. 2003;100(9):5034-5039. Zalzman M, Anker-Kitai L, Efrat S. Differentiation of human liver-derived, insulin-producing cells toward the beta-cell phenotype. Diabetes. 2005;54(9):2568-2575. Jiang J, Au M, Lu K, et al. Generation of insulin-producing islet-like clusters from human embryonic stem cells. Stem Cells. 2007;25(8):1940-1953. Kroon E, Martinson LA, Kadoya K, et al. Pancreatic endoderm derived from human embryonic stem cells generates glucose-responsive insulin-secreting cells in vivo. Nat Biotechnol. 2008;26(4):443-452. Lowry WE, Richter L, Yachechko R, et al. Generation of human induced pluripotent stem cells from dermal fibroblasts. Proc Natl Acad Sci U S A. 2008;105(8):2883-2888. Park IH, Zhao R, West JA, et al. Reprogramming of human somatic cells to pluripotency with defined factors. Nature. 2008;451(7175):141-146. Takahashi K, Tanabe K, Ohnuki M, et al. Induction of pluripotent stem cells from adult human fibroblasts by defined factors. Cell. 2007;131(5):861-872. Yu J, Vodyanik MA, Smuga-Otto K, et al. Induced pluripotent stem cell lines derived from human somatic cells. Science. 2007;318(5858):1917-1920. Mali P, Ye Z, Hommond HH, et al. Improved efficiency and pace of generating induced pluripotent stem cells from human adult and fetal fibroblasts. Stem Cells. 2008;26(8):1998-2005. Meissner A, Wernig M, Jaenisch R. Direct reprogramming of genetically unmodified fibroblasts into pluripotent stem cells. Nat Biotechnol. 2007;25(10):1177-1181. Thatava T, Armstrong AS, De Lamo JG, et al. Successful disease-specific induced pluripotent stem cell generation from patients with kidney transplantation. Stem Cell Res Ther. 2011;2(6):48. Baharvand H, Totonchi M, Taei A, Seifinejad A, Aghdami N, Salekdeh GH. Human-induced pluripotent stem cells: derivation, propagation, and freezing in serum- and feeder layer-free culture conditions. Methods Mol Biol. 2010;584:425-443. Chen BZ, Yu SL, Singh S, et al. Identification of microRNAs expressed highly in pancreatic islet-like cell clusters differentiated from human embryonic stem cells. Cell Biol Int. 2011;35(1):29-37. Yesil P, Lammert E. Islet dynamics: a glimpse at beta cell proliferation. Histol Histopathol. 2008;23(7):883-895. Cissell MA, Zhao L, Sussel L, Henderson E, Stein R. Transcription factor occupancy of the insulin gene in vivo. Evidence for direct regulation by Nkx2.2. J Biol Chem. 2003;278(2):751-756. Ashery-Padan R, Zhou X, Marquardt T, et al. Conditional inactivation of Pax6 in the pancreas causes early onset of diabetes. Dev Biol. 2004;269(2):479-488. Wang J, Elghazi L, Parker SE, et al. The concerted activities of Pax4 and Nkx2.2 are essential to initiate pancreatic beta-cell differentiation. Dev Biol. 2004;266(1):178-189. Sussel L, Kalamaras J, Hartigan-O'Connor DJ, et al. Mice lacking the homeodomain transcription factor Nkx2.2 have diabetes due to arrested differentiation of pancreatic beta cells. Development. 1998;125(12):2213-2221. Mellitzer G, Bonné S, Luco RF, et al. IA1 is NGN3-dependent and essential for differentiation of the endocrine pancreas. EMBO J. 2006;25(6):1344-1352. Murtaugh LC. Pancreas and beta-cell development: from the actual to the possible. Development. 2007;134(3):427-438. Ferguson LR. Dissecting the nutrigenomics, diabetes, and gastrointestinal disease interface: from risk assessment to health intervention. OMICS. 2008;12(4):237-244. Paulson QX, Hong J, Holcomb VB, Nunez NP. Effects of body weight and alcohol consumption on insulin sensitivity. Nutr J. 2010;9:14. Takeda J, Seino S, Bell GI. Human Oct3 gene family: cDNA sequences, alternative splicing, gene organization, chromosomal location, and expression at low levels in adult tissues. Nucleic Acids Res. 1992;20(17):4613-4620. Hori Y, Rulifson IC, Tsai BC, Heit JJ, Cahoy JD, Kim SK. Growth inhibitors promote differentiation of insulin-producing tissue from embryonic stem cells. Proc Natl Acad Sci U S A. 2002;99(25):16105-16110. Blyszczuk P, Czyz J, Kania G, et al. Expression of Pax4 in embryonic stem cells promotes differentiation of nestin-positive progenitor and insulin-producing cells. Proc Natl Acad Sci U S A. 2003;100(3):998-1003. Soria B, Roche E, Berná G, León-Quinto T, Reig JA, Martín F. Insulin-secreting cells derived from embryonic stem cells normalize glycemia in streptozotocin-induced diabetic mice. Diabetes. 2000;49(2):157-162. Assady S, Maor G, Amit M, Itskovitz-Eldor J, Skorecki KL, Tzukerman M. Insulin production by human embryonic stem cells. Diabetes. 2001;50(8):1691-1697. Xu X, Browning VL, Odorico JS. Activin, BMP and FGF pathways cooperate to promote endoderm and pancreatic lineage cell differentiation from human embryonic stem cells. Mech Dev. 2011;128(7-10):412-427. Liu SH, Lee LT. Efficient differentiation of mouse embryonic stem cells into insulin-producing cells. Exp Diabetes Res. 2012;2012:201295. Cheng X, Ying L, Lu L, et al. Self-renewing endodermal progenitor lines generated from human pluripotent stem cells. Cell Stem Cell. 2012;10(4):371-384. Zhang D, Jiang W, Liu M, et al. Highly efficient differentiation of human ES cells and iPS cells into mature pancreatic insulin-producing cells. Cell Res. 2009;19(4):429-438. D'Amour KA, Bang AG, Eliazer S, et al. Production of pancreatic hormone-expressing endocrine cells from human embryonic stem cells. Nat Biotechnol. 2006;24(11):1392-1401. Ben-Yehudah A, White C, Navara CS, et al. Evaluating protocols for embryonic stem cell differentiation into insulin-secreting beta-cells using insulin II-GFP as a specific and noninvasive reporter. Cloning Stem Cells. 2009;11(2):245-257. Alipio Z, Liao W, Roemer EJ, et al. Reversal of hyperglycemia in diabetic mouse models using induced-pluripotent stem (iPS)-derived pancreatic beta-like cells. Proc Natl Acad Sci U S A. 2010;107(30):13426-13431. Thatava T, Kudva YC, Edukulla R, et al. Intrapatient variations in type 1 diabetes-specific iPS cell differentiation into insulin-producing cells. Mol Ther. 2013;21(1):228-239. Mohamad O, Drury-Stewart D, Song M, et al. Vector-free and transgene-free human iPS cells differentiate into functional neurons and enhance functional recovery after ischemic stroke in mice. PLoS One. 2013;8(5):e64160. Sams A, Powers MJ. Feeder-free substrates for pluripotent stem cell culture. Methods Mol Biol. 2013;997:73-89. Acknowledgements: Anahita Shaer, Negar Azarpira, and Mohammad Hosein Karimi participated in the study design. Anahita Shaer did all the experiments, gathered the data, and performed the statistical analyses. All of the authors participated in the manuscript preparation. Anahita Shaer wrote the manuscript, with valuable assistance from Negar Azarpira. We would like to thank the Research Improvement Center of Shiraz University of Medical Sciences, Shiraz, Iran, and Ms. A. Keivanshekouh for improving the English in the manuscript. We also are grateful to Mrs. Elaheh Esfandiari and Mrs. Masoumeh Darai for assisting with the cell cultures and polymerase chain reaction. The authors declare that they have no financial interests related to the material in the manuscript. The study was financially supported by a grant from Iran National Science Foundation (INSF). The authors have no conflicts of interest to declare.